Emmy-nominated actress Millie Bobby Brown has been announced as UNICEF's newest Goodwill Ambassador. The appointment – marked on World Children's Day at United Nations Headquarters and the Empire State Building in New York – makes the 14-year-old UNICEF's youngest-ever Goodwill Ambassador. "It's a dream come true to become a UNICEF Goodwill Ambassador," said Brown. "It's a huge honor to join such an impressive list of people who have supported UNICEF over the years. I am looking forward to meeting as many children and young people as I can, hearing their stories, and speaking out on their behalf." In her role as UNICEF Goodwill Ambassador, the British star of Stranger Things will use her global platform to help raise awareness of children's rights and issues affecting youth, such as lack of education, safe places to play and learn, and the impact of violence, bullying and poverty. Brown has supported UNICEF's work since 2016, hosting its 70th anniversary celebrations at the United Nations in 2016, and championing UNICEF's inaugural World Children's Day last year. She joins a list of UNICEF Goodwill Ambassadors including: Muzoon Almellehan, David Beckham, Orlando Bloom, Jackie Chan, Priyanka Chopra, Danny Glover, Ricky Martin, Leo Messi, Liam Neeson, Shakira and Lilly Singh. "I'm delighted to welcome Millie to the UNICEF family, particularly on World Children's Day – a day that is all about giving children and young people a voice," said UNICEF Executive Director Henrietta Fore. "Children are their own best advocates. I know that Millie will use her passion and dedication to defend the rights of vulnerable children and young people everywhere." World Children's Day – celebrated on 20th November – is a global day of action 'for children, by children' to raise awareness and funds for the millions of children that are unschooled, unprotected and uprooted. UNICEF is inviting the public to go online and sign a global petition asking leaders to commit to fulfilling the rights of every child now and for future generations, so that every child is in school, safe from harm and can fulfil their potential. 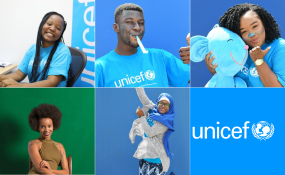 As part of the day, UNICEF is asking supporters to raise their voices in solidarity with the most disadvantaged and vulnerable children by helping 'turn the world blue' – by doing or wearing something blue at school, on the streets, on social media, in boardrooms and on sports fields on 20 November. To kick-start the activation, last week Brown starred in a short video encouraging supporters to #GoBlue in support of children's rights. In countries around the world, children will take over parliaments in Montenegro, Peru, Tonga, Suriname and Zambia, amongst others. The Taoiseach of Ireland (Prime Minister), Leo Varadkar, will take part in a 'Kids Takeover' of his office. In Burkina Faso, young people from West and Central Africa will take part in an 'Africa Dialogues' speaking series to tell decision makers about the 'Africa We Want'. In India, UNICEF Goodwill Ambassador Sachin Tendulkar will play a game of unified football with children, with the crowd encouraged to go blue. In addition, children will take over the national broadcaster, Doordarshan, and give awards to MPs that raise children's issues in Parliament. More than 50 organizations globally will turn over roles to children or show their support for every child, including FC Barcelona, Beko, All Blacks, Qantas and Amadeus. Johnson & Johnson Headquarters will also be taken over by children as they announce a US$10 million commitment to support UNICEF's health programmes. The LEGO Group and LEGO Foundation will host a number of `Build the Change' events around the world where children are invited to share their views on what their dream school looks like. Kherann Yao, 23, environmentalist, Detty Dione Datto, 24, Vlogger and disabilities advocate, Tchonté Silué, 24, blogger and education advocate, UNICEF Cote D'Ivoire.